Research plays a crucial role in economies that value knowledge creation and innovation. As more countries develop their research and development (R&D) capabilities and embark on research initiatives and partnerships at the international level, research integrity becomes all the more important. Increasing globalisation and international collaborations also highlight the importance of promoting integrity in cross-border research. Some 350 senior education and research policymakers, leaders of research-funding agencies, university leaders and faculty, researchers, and academic publishers from 58 countries are meeting in Singapore to discuss the key issues of research misconduct policy, responsible conduct of research, education and the promotion of professional responsibility in research. 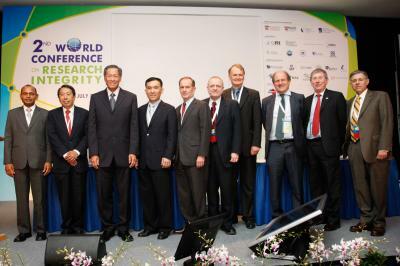 The World Conference on Research Integrity 2010 is hosted by Singapore's leading research-performing organisations, namely NTU, NUS, SMU and A*STAR, with support from Singapore's Ministry of Education and the Singapore Tourism Board. The theme for conference, held at Pan Pacific Singapore from 21 to 24 July 2010, is 'Leadership Challenges and Responses'. During the conference, participants will exchange views and work together to develop a set of guidelines and recommendations for promoting integrity in research on a global scale. At the end of the conference, they hope to affirm the 'Singapore Statement on Research Integrity', which will serve as a benchmark statement for research integrity and a guide for professionally responsible research practices throughout the world. The guest-of-honour, Singapore's Minister for Education, Dr Ng Eng Hen, officiated at the opening of the conference on 22 July. In his opening speech, Dr Ng highlighted the important of research integrity as public trust. "High standards of integrity and ethics in research are crucial in Singapore's quest to be a R&D node in this global network," he said. "Knowledge without integrity can harm. The 2nd World Conference on Research Integrity is therefore timely and will assist us in reviewing our systems and procedures for our universities and research institutes." "To this end, I am glad that this conference has already set itself a discrete deliverable. It aims to crystallise one of the main recommendations from the 1st World Conference on Research Integrity, which is the need for consistent institutional and national policies. It will work towards developing a set of fundamental and basic principles to be agreed by consensus at this meeting, and which will be known collectively as the Singapore Statement." 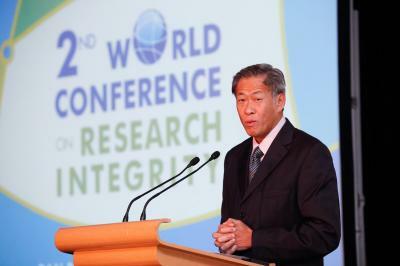 "It is my hope that this Statement will serve as a basic document for a global code of conduct and protocols, from which individual countries can adapt and use for their own institutions to address the issues pertaining to research integrity and good research practices," said Dr Ng, who is also Singapore's Second Minister for Defence. Among those present at this morning's conference opening were Mr Lim Chuan Poh, Chairman of Singapore's Agency for Science, Technology and Research (A*STAR); Dr Su Guaning, President of Nanyang Technological University (NTU); Professor Howard Hunter, President of Singapore Management University (SMU); Professor Bertil Andersson, Provost of NTU; and Professor Seeram Ramakrishna, Vice President (Research Strategy) of National University of Singapore (NUS). Mr Lim, Chairman of A*STAR, said: "Arriving at a common set of norms and standards for research integrity has assumed even greater importance, as stakes get higher in an increasingly competitive global R&D landscape, and as R&D pursuits increasingly cut across scientific fields, national borders and organisational cultures, and take on global dimensions with impact on areas such as climate change or managing pandemics. The conversations that will take place among the key stakeholders from academia, public research agencies, policymakers as well as the media, coming from 58 countries at the 2nd World Conference on Research Integrity, are meaningful steps for us to achieve a common set of global standards." "As an organisation with a vibrant community of 2,300 research scientists and engineers, and with extensive collaborations with other international organisations and the industry, A*STAR is fully committed to upholding the highest standards of research integrity. To this end, the A*STAR Code of Practice and Procedure relating to Integrity in Research, which was developed based on international best practices, serves as a guide for A*STAR researchers," said Mr Lim. "NTU is proud to have been appointed the lead organiser and host for this event, bringing together renowned experts in their respective fields to address the vital issue of research integrity," said NTU President Dr Su in his welcome speech at the opening of the conference. "Cutting across all disciplines, research integrity has become increasingly important today, given that innovation and R&D are key drivers of economic growth worldwide." "The Singapore Statement shall serve as a fundamental and landmark document containing basic principles that can be used as a standard for research integrity throughout the world. Such a standard will be especially important for educators and educational institutions like NTU, growing rapidly as major research universities," Dr Su said. "At NTU, we have taken steps to introduce a clear policy, based of course, with due acknowledgement, on the model provided by the US Office of Research Integrity. We have a zero-tolerance policy for anyone, whatever their status, who breaches the university's research integrity norms." NTU Provost, Professor Andersson, who was instrumental in the launch of inaugural World Conference on Research Integrity held in September 2007 in Lisbon, Portugal, when he was the Chief Executive Officer of the European Science Foundation, and who successfully promoted the bid for Singapore to host the 2nd World Conference on Research Integrity, said: "The importance of research integrity in a world that is increasingly globalised and where research is becoming more multidisciplinary cannot be over emphasised. That the conference is being held in Singapore reflects the increasing importance of the Asia Pacific region as a hub for R&D, and of Singapore as key node in this hub." SMU President, Professor Hunter, said: "The issue of research integrity is closely entwined with the SMU culture and the SMU approach to education. Integrity is one of the fundamental values of the university and it is infused into what we teach, how we teach and what students are exposed to. I look forward to the discussions during the conference and most importantly, the meaningful impact these will have on the sphere of research and beyond." NUS Vice President (Research Strategy), Professor Ramakrishna, said: "Nearly one-third of the world's R&D spending comes from public funds, and naturally, there is greater expectation on the research community to deliver scientific breakthroughs. Hence, the emphasis on research integrity cannot be understated. NUS, which has an international community of faculty and students from over 100 countries, strongly values research integrity and actively promotes high standards in our research practices. We will continue to review our practices to ensure that they remain relevant to the evolving research landscape." Conference co-chair, Professor Nicholas Steneck of the University of Michigan, said: "Singapore has provided the ideal venue for the 2nd World Conference on Research Integrity and we appreciate the support which we have received for Singapore's major research organisations." Agreeing, the other conference co-chair, Mr Tony Mayer, NTU's Europe Representative, who is also acting for the European Science Foundation, added: "With an international conference planning committee to assist us, we hope that we have created a stimulating programme which will, through the Singapore Statement, become a landmark event in good research practice throughout the world."